Fall is just around the corner and trends are emerging in home décor as well as seasonal decorations. Find out the latest trends that are popping up for Fall 2016! This year, decor accessories are popular in an antiqued brass finish. They are not just to be mounted on the wall or set on a shelf. These items are showing up as lamp bases and hooks that you. Shiny gold and silver finishes are still popular and make accessory items more versatile by adding a feminine touch to the masculine antler. Fall inspired prints are beautiful to display this time of year. This includes realistic motifs that are painted by acrylic or water color. These prints are mostly on fabrics, table cloths, dishware and other seasonal fall décor. Popular motif items include leaves, acorns or even woodland creatures. Traditional styled furniture is perfect to set out during the fall. Keep an eye out for tufted and tight back upholstery. Exposed wood legs are making a comeback and will be seen often this season. Other types of furniture beautiful in the fall are antiqued painted wood pieces with ornate carving and subdued metal hardware. Contemporary needle point and beadwork looks great when set out or hung up in the fall. This type of décor is popular with bright colors, as well as more subdued tones. Think of the colors of fall. Bright reds, oranges and yellows along with dark browns, coppers and dark greens. Fall inspired string lights are fun to add to your home, especially outdoors. Acorn styled lights or tiny fairy inspired LED strings are popular this year and add a touch of whimsy to the fall season. Bowls filled with fall fruits, pine cones or colorful fall leaves can be a beautiful addition to your entryway and brighten up your day both coming into your home and leaving each day. A few adjustments in your home decor will be a fun addition as the days become shorter. 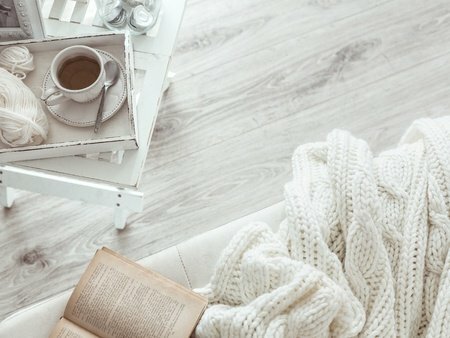 Add a cup of tea and a warm blanket and you will be ready for the season!